Hello from Spain! Caleb and I live one street over from this picture (which I did not take but is so lovely!) 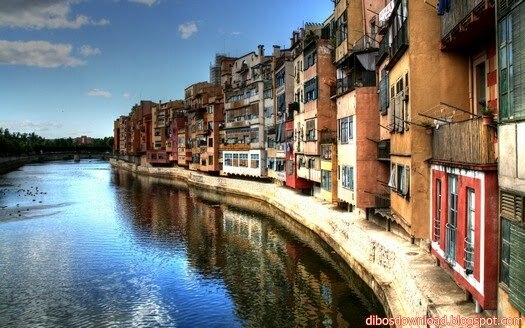 in the old town of Girona. And here I am, blogging about it! Caleb told me I should blog, and then so did Michelle…I’ve always thought blogging was somewhat egotistical unless you were living in the dirt in Africa or something. But chelle said I needed to get over myself and do it, and I’m kind of excited about being able to share some of our experiences so far. (I even came up with a pun for the blog! Micah will be so proud of me.) As long as a have a good enough sense of humor to laugh at myself when I look back on these, I think it should be fun. I’ve been here for exactly two weeks now, and it has been so interesting. (This will be a long first post!) The first week was a unique combination of stressful and slow. Stressful because 1) we couldn’t get into our apartment for several days longer than we were expecting 2) we were sleeping on a futon together 3) the banks close at 2 every day, what? 4) I naturally could not remember a word of Spanish for many days. But really, how stressful can things be in Spain? It’s not like we were rushing around, trying to desperately get things done in time so we could move. (People do not RUSH in Spain.) We could really only do one thing per day, and then wait for the banks to reopen, and then solve one more issue, and then wait for the banks to reopen, etc. But of course we did make it into our apartment (oh technically I think it’s called a flat, which is way more fun.) And it is awesome. I didn’t realize this was a part of the package when I married him, but Caleb has great taste. He found us a place in the old town of Girona, on a winding little street with ancient walls and a couple cathedrals down the way, but with a newly re-done interior. *sigh* he’s great. Ever since we moved in and returned our rental car it’s been “figure out Girona” time for me. Caleb went back to training, and instead of blindly following him around (he’s spent a good amount of time here with his teammates in the past) I had to put on my walking shoes, dig out my Spanish (from very far back in my memory) and utilize my fantastic sense of direction! (which is slightly hindered by the mountains not always being in the west.) I’m kidding. But really, it is my best way of not getting lost, because I can’t remember street names the way Caleb can. Instead I just make sure I always know what direction the giant river is and I do fine. I’ve been looking all over town for the different types of food we want, kitchen supplies, shelves for the bathroom, shelves for the closets, hangers, cookie sheets (WHERE are the cookie sheets???) a map for Caleb’s rides, the free Catalan classes we heard of, contact solution, spices…you get the picture. I have been mostly successful, and am slowly discovering tiny little shops all over the old town that have the things I need. This makes everything easier because I don’t have to walk to the mercadonas (bigger grocery stores) as often. It’s a further walk carrying everything back. I’ve been enjoying the hours of walking every day, but it’s not as fun when you’re carrying a bunch of stuff. Of course there’s always the possibility that we’ve missed a mercadona that’s very close to us and are walking far away for no reason, so maybe someday I’ll blog about how exciting the new mercadona is. Now! More recently I am super proud of myself. Yesterday, I figured out the bus system. I know, lots of people can ride the bus. But I’m telling you the maps were crazy complicated and everything was in Catalan, so this is a win. I went to the mall to look for some things for the “flat” I still hadn’t been able to find, and it was a pretty successful trip. (The girly girl in me was relieved to find that the mall is great, and cheaper than a lot of other places around here!) Today was also a good day. I was just going to go out to a few shops around where we live to pick up some produce, but ended up going out to the main street. I’m so glad I did! They were having some sort of Saturday flower market in the Rambla. I kept walking along the river, and went past a store that I have never seen open before. (Side note: I have yet to figure out the system of when stores open and close. I thought it worked around the siesta, but it seems to be more random than that. Maybe there is no system.) Anyway I went in, and it was quite the store. I can only describe it (lovingly) as a junk store. Things you would never think of as being important until you don’t have, that you usually get at Wal-Mart or just the grocery store. And lo and behold, the main thing Caleb has been wanting since we moved in was on the top shelf! Stack-able plastic drawers! We’ve both looked EVERYWHERE for those, (our apartment doesn’t have any drawers or shelves) and the only ones we could find were 100 euros. What the heck?? Who would pay that? I finally found some cheap ones, and all that remained was to carry them home. I’m sure I looked fantastic lugging huge plastic stack-able drawers half way across the city, but I did it. They are waiting to surprise Caleb as we speak. Never done that in a foreign country before! I am very excited to follow your blog! I think this is a great idea! The nitty gritty details of how to make a foreign city “work” for you will be really interesting. The trials and tribulations of language barriers and breakthroughs as well. Keep it coming. LOVE IT!!!!!! Oh, I will look forward to reading this blog for sure. So glad that you got over yourself and did it:-) Love you! dude this is a fantastic idea. I love that i can keep up with you guys from so far away. sounds like such a fun adventure!! ps: cale should make a guest appearance on our blog sometime! Well done, Allyson! Great idea. It will be fun reading of your experiences. Thanks for posting. Ally!! I loved reading this! I can’t wait to hear more of your adventures!